Statistics show that seat belts save lives. When used correctly, wearing a seat belt reduces the risk of fatal injury to front seat passenger car occupants by 45%, and risk of moderate-to-critical injury by 50%. For those riding in the rear of vans and sport-utility vehicles (SUVs) during a car crash, rear seat belts are 73% better at preventing fatalities. Keep in mind that victims are not properly restrained in more than one-half of all fatal car accidents. Also, children are likely to be buckled 92% of the time when adults in the car use seat belts, as opposed to 72% of the time when adults are not using them. Note: 2014 is the most recent available statistics. 78.7% of people in an accident wore a seat belt. Of total fatal accidents, 48.1% were not wearing a seat belt. Of those who wore a seat belt during an accident, 76,452 were not injured. Of those who did not wear a seat belt during an accident, only 4,605 were not injured. Since 1994, drivers use seat belts 16.5% more often. Seat belt use reached 85% in 2010, up from 84% in 2009. The Western part of the United States has the highest overall seat belt use percentage at 95%. More than 90% of people used a seat belt when traveling on an expressway in 2010. More weekday travelers used seat belts in 2010. The percentage increased to 85%. States with 'primary laws' regarding seat belts had higher percentages of seat belt use. A primary seat belt law means you can be pulled over solely for not wearing one. In 2009, seat belt use rose from 83% to 84%. Seat belt use saved an estimated 12,713 lives in 2009 alone. In 2008, seat belt use stood at 83%, up from 82% in 2007. Seat belt use increased to 90% on expressways and remained at 80% for surface streets. In states where rear seat belt use was not required in 2008, only 66% of adult passengers wore their seat belts while sitting in the backseat. In states where rear seat belt was required, 85% of adult backseat passengers buckled up. In 2007, seat belt use was at 82%, a slight increase from 81% in 2006. In the Northeast in 2007, seat belt use jumped four percentage points. In states in which motorists can be pulled over solely for not using a seat belt, seat belt use rose two percentage points to 87% in 2007. Now the percentage point difference between seat belt use in these states and those with weaker enforcement is 14 points. Since the National Occupant Protection Use Survey (NOPUS) began collecting data in 1994, seat belt use has risen steadily. Since then, there also has been a steady decline in passenger vehicle occupant fatalities per mile traveled. Among 16-24-year-olds, seat belt use continued to be lower than other age groups. Seat belt use is lower among drivers driving alone than among drivers with passengers. Females wore their seat belt more than males in 2007. In 2007, seat belt use among children under age eight increased to 89%. The percentage of youth ages 16-24 using seat belts was up to 77% in 2007, compared to only 53% in 1994. Wearing a seat belt reduces the risk of fatal injury by almost 50%. For children, the risk of fatal injury is reduced by 71% with the use of child safety seats. 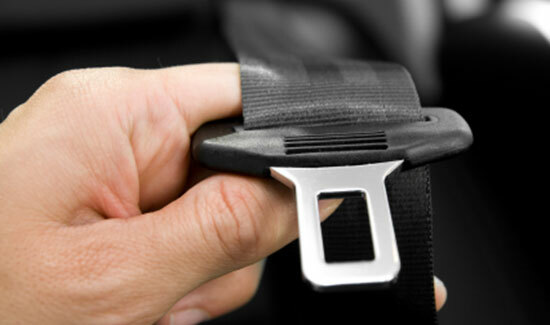 The NHTSA estimates that 15,383 lives were saved by seat belts in 2006. From 1975 to 2006, seat belts have saved the lives of 226,567 people. As car safety improves, more lives are saved. Of those thrown completely out of a vehicle in a car crash, 75% died. Only one percent of people totally ejected from their cars had on a seat belt during the crash. Over 30% were not wearing seat belts. In 2006, 42,642 people were killed in car accidents. The NHTSA was able to gather seat belt data on 30,251 of the 42,642 car occupants that died in car crashes. Nearly 56%, or 16,836 people, of the 30,251 with available restraint information were not wearing seat belts at the time of the fatal auto accident. Research found that 7,064 people killed in car wrecks during the daytime were not wearing safety belts. Of those killed in nighttime car accidents, 9,615 were not wearing seatbelts. In 2002, 43,005 people died in traffic accidents. Seat belt data was available for 32,598 of those involved in fatal car crashes. Of that number, 19,103 were not wearing seat belts. 4,200 lives could be saved each year if 90% of the U.S. population wore seat belts. Fatalities and accidents involving those not wearing seat belts cost the U.S. approximately $20 billion per year. Of that cost, 74% of the tab is paid for by the public. One out of four Americans still doesn't wear a seat belt. Many states handle seat belt enforcement differently. For some, not wearing a seat belt is a primary offense. This means that a driver or passenger can be pulled over solely for not wearing a seatbelt. In others, failure to wear a seat belt in a moving vehicle is a secondary offense. This means that police officers and other law enforcement officials can only pull over motorists after they've committed a primary offense such as speeding or failing to stop at a red light.